Here's the perfect set for every child that is ready to explore the fun of real baking - the Intoduction to Baking Set for Kids from Handstand Kitchen! The perfect addition to your "kitchen classroom", this complete 17-piece set includes everything you need to bake all of your favorites with your children. 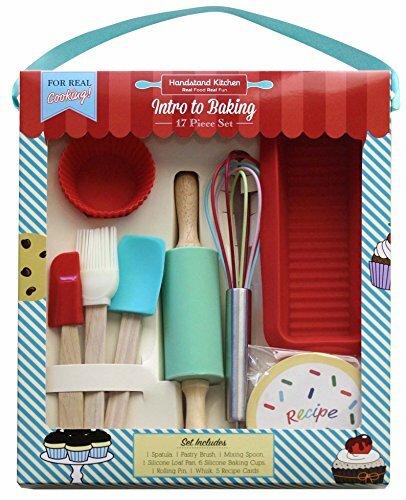 Baking utensils included in the set are sized to be easily used by both older children and adults and each piece is sturdy enough to be of regular use in your kitchen. Match the set with aprons from Handstand Kitchen for even more fun!